Happy Halloween! Today will be a lighthearted day at the law school in many respects (even though the 1Ls have an LRW exam to prepare for tomorrow!). For instance, I am honored to serve as one of four judges for the Student Bar Association’s Halloween costume contest during lunch today. Law students, faculty, staff, and administrators can sometimes be overgrown children, at least for a day! The next major American holiday is Thanksgiving, and our students will receive a “break” for that holiday starting three weeks from today. I want to speak a word to the family and friends of our law students in regard to Thanksgiving break. I know you all miss your student’s attention terribly, and a five day break sounds fantastic. I want you to know, however, that classes end for the semester just one week after Thanksgiving break begins — and that the first 1L final hits just one week after classes end. What this means is that no student needs to take a complete five days off from their studies so close to the very important finals season. Some may be in a position to take more time off than others, but that varies widely, and you should not expect that your student will be able to simply stop their studies for five consecutive days. On behalf of the students, please do not pressure your students one way or another as to how they handle Thanksgiving break. Some will choose to remain in Malibu and spend the break studying (they are all invited to a Thanksgiving feast with my family if this is the case!). Others will choose to go home for the holiday, but will need significant time in a quiet place to work on their outlines in preparation for finals. A few may be so on top of their outlines that they can enjoy several days at home without much need to hit the books. None of these options are better than the others. All are preparing for the same thing, and each individual student will have different needs during the preparation process. There is good news on the horizon. A “real” break is coming when the semester ends! The last final exam is on Friday, December 14, which is just six weeks from Friday! You and your student will then have three glorious weeks when they don’t have to study anything! That is truly something for which to give thanks. The following email was sent out to our alumni today, and I thought you all would enjoy it as well. In what proved to be one of the most challenging admission cycles that we can remember, Pepperdine Law once again enrolled one of its most competitive classes in the history of the law school. Applications were down nationally by approximately 13 percent, and many law schools experienced significant enrollment decreases. Pepperdine’s incoming class was 6 percent larger than it was last year, and we maintained our record high median GPA of 3.63 and had a median LSAT of 162 (85th percentile). This impressive entering class is a testament to the strength of our law school and community. 107 different undergraduate schools are represented. The top feeder schools for the class of 2015 are UCLA, Pepperdine, UC Santa Barbara, UC Irvine, UC Berkeley, and USC. Boston College, Gonzaga, and Indiana-Bloomington are the top out-of-state feeder schools. 46% of the students are women. 25% of the students identify as African American, Asian American, Latino or Native American. 37% of the students are from outside California coming from 26 states and 2 foreign countries. 4 of the students have served our country in the military. The class of 2015 has a wide-variety of backgrounds, talents, and past-careers. The class includes a player from the women’s national soccer team, an officer in the Navy and Navy football player, a mother of three kids in college, an ordained rabbi, a professional poker player, a baseball player from Dartmouth, and a former president of a corporation. Many of our students are committed to service. One recently returned from Uganda, where he worked for an NGO for the past five years. Pepperdine University School of Law has a tradition of public service, which includes a great many judges, and state and local officials. Todd Platts has been a member of the House of Representatives from Pennsylvania for some years, but is not running again this year. There are a number of alums holding state and local positions in government. James Hahn is the only person to hold the positions of Los Angeles City Controller, City Attorney, and Mayor. Pierre Prosper served as Ambassador at Large for War Crimes Issues. Greg Totten is District attorney for Ventura County. Rick Caruso has served as president of the L.A. Police Commission, was the youngest person to ever serve on the L.A. Water and Power Commission (at age 25), and is a member of the L.A. Coliseum Commission. In September, Pepperdine Law welcomed back U.S. Attorney André Birotte Jr. (JD ’91), who shared his journey in becoming a United States Attorney for the Central District of California. Alan Jackson (JD ’94) is a candidate for the Los Angeles County District Attorney in the upcoming November election. If elected, Pepperdine alumni will serve as the principal prosecutors at the county and federal level in Los Angeles and Ventura County, where Pepperdine Law Board of Visitors member Greg Totten (JD ’82) currently serves as the District Attorney. What a record of public service for three Pepperdine graduates of whom we are so proud! The School of Law has been honored to have the opportunity to host a variety of events and guests over the years. 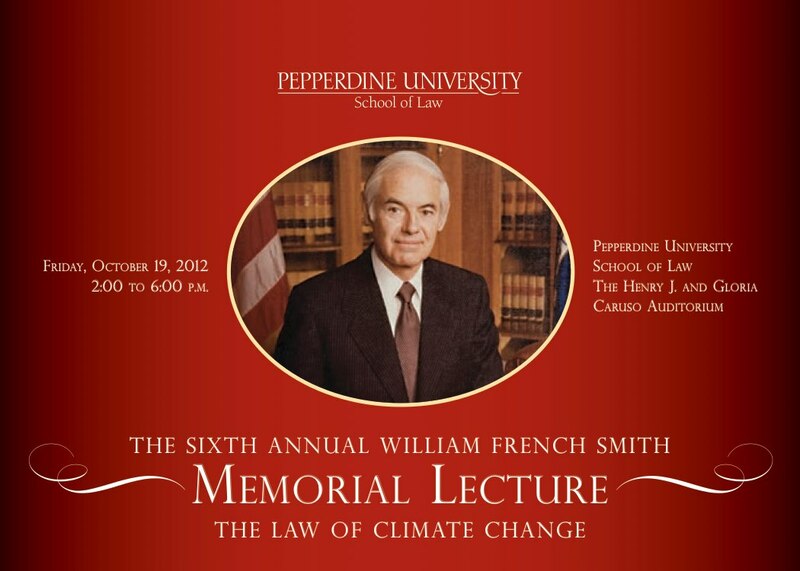 Most recently, Pepperdine Law hosted the sixth annual William French Smith Lecture Series. The Oct. 19 event welcomed a host of presenters, including John C. Nagle, John N. Matthews Professor of Law, University of Notre Dame Law School, and Lisa E. Heinzerling, Professor of Law, Georgetown University Law Center. An introduction and remarks were made by Pepperdine School of Law Dean Deanell Reece Tacha, Duane and Kelly Roberts Dean and Circuit Judge, U.S. Court of Appeals for the 10th Circuit (ret.). A mock oral argument on Native Vill. of Kivalina v. ExxonMobil Corp., 663 F. Supp. 2d 863 (N.D. Cal. 2009), aff’d __ F.3d ___, 2012 WL 4215921 (9th Cir. Sept. 21, 2012) included advocates David M. Axelrad (Appellant), Partner, Horvitz & Levy LLP – Los Angeles, California, and Richard O. Faulk (Respondent), Partner, Gardere Wynne Sewell LLP – Houston, Texas. Judges for the mock trial included The Honorable David B. Sentelle, Chief Judge, U.S. Court of Appeals for the D.C. Circuit; The Honorable Timothy M. Tymkovich, Circuit Judge, U.S. Court of Appeals for the 10th Circuit; and Kenneth W. Starr, President, Baylor University. Additionally, the Global Justice Speaker Series at the Herbert and Elinor Nootbaar Institute for Law, Religion, and Ethics hosted the launch of USAID’s Counter Trafficking in Persons (CTIP) Campus Challenge. Response from the Pepperdine community was phenomenal. To read more, visit the Pepperdine Law School website. The Honorable Deanell Reece Tacha was selected to receive the prestigious 2012 American Inns of Court’s A. Sherman Christensen Award. The award was presented by Judge Patrick E. Higginbotham at the American Inns of Court’s annual Celebration of Excellence, held at the Supreme Court of the United States on October 20. Given in the name of the founder of the first American Inn of Court, this award is bestowed upon a member of an American Inn of Court who, at the local, state, or national level, has provided distinguished, exceptional, and significant leadership to the American Inns of Court. The recipient exemplifies the qualities of leadership and commitment displayed by Judge A. Sherman Christensen. Dean Deanell Reece Tacha continues her efforts to upgrade the connection between Pepperdine Law and its alumni serving at various capacities throughout the country. Her most recent tour stop brought her to Ventura on Oct. 16th. Her next stop will be on Nov. 1 in San Diego. For a full list of Tacha Tour 2.0 stops, please visit the Tacha Tour website. The Criminal Law Society is hosting a lunchtime panel today on “Implementing the Death Penalty: Cost Burdens and the Need for Transparency in Seeking Capital Punishment.” The panel will include Judge Arthur L. Alarcón and Paula M. Mitchell, authors of “Executing the Will of the Voters? : A Roadmap to Mend or End the California Legislature’s Multi-Billion Dollar Death Penalty Debacle”; and Professor Carol A. Chase, author of “Unpredictable Doom and Lethal Injustice: An Argument for Greater Transparency in Death Penalty Decisions.” Dean Deanell Reece Tacha will moderate this event. 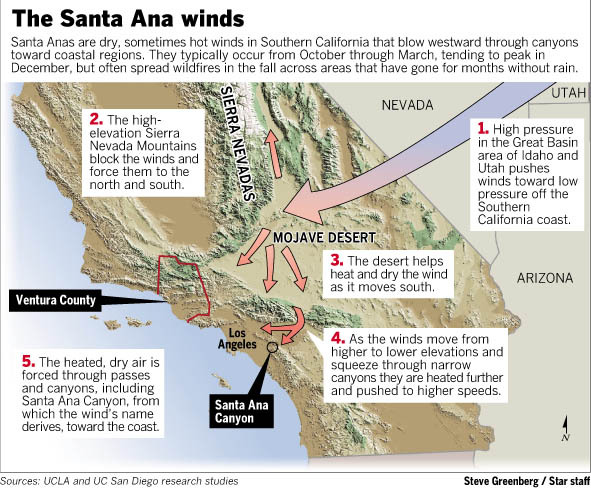 Those of us not native to Southern California are a little taken aback when the Santa Ana Winds come to town. And they are most definitely in town! HERE is an article about the current windy conditions in Malibu. 2. Once they clear out, the ocean views are even more spectacular than normal. Lots of pop culture references to the Santa Anas exist. HERE is a YouTube link to a Beach Boys song dedicated to our present weather! I fully intended to attend a luncheon hosted by our Clinical Education Program yesterday, but so many students showed up that there wasn’t room for me! This is the sort of problem that makes me smile. There are actually two identical luncheons this week (yesterday and today), but I have a standing lunch meeting on Thursdays so I cannot make it today. Still, I heard that many more students plan to attend the luncheon today! One of the major benefits of the changes made to our first year curriculum this year is enhanced opportunities for our students to participate in clinics and externships in their upper division years. I am glad to see that so many students are coming out early to learn of the possibilities. The super short way to describe clinics/externships is that they provide students opportunities to earn academic credit by doing real legal work with real clients under the supervision of a licensed attorney. More than just “working,” however, the students have the opportunity to reflect on their experiences and receive feedback and instruction from their instructors. Although she didn’t say a word about it around here, our dean, Deanell Reece Tacha, traveled to the United States Supreme Court in Washington, D.C., this past Saturday to be awarded the A. Sherman Christensen Award. The award is given by the American Inns of Court to honor an Inn member who, at the local, state, or national level has provided distinguished, exceptional and significant leadership to the American Inns of Court movement. HERE is a link to her biography on the website of the American Inns of Court. Today is one of the biggest days of the year at the Pepperdine University School of Law: the William French Smith Lecture. HERE is a link to the impressive lineup on tap today. And HERE is a link to an entry on the Department of Justice website where you can learn more about the fascinating life of the Lecture’s namesake. Dean Emeritus Ronald Phillips is the architect of the Pepperdine University School of Law. He was its founding dean in 1970 when the school was simply a storefront night school in Orange County. Under his watch (its first 27 years! ), the school was accredited by the ABA and the AALS, moved to Malibu, and transformed into a world-class law school. In my estimation, however, the most important element of the school Dean Phillips envisioned, implemented, and built is its unique atmosphere. 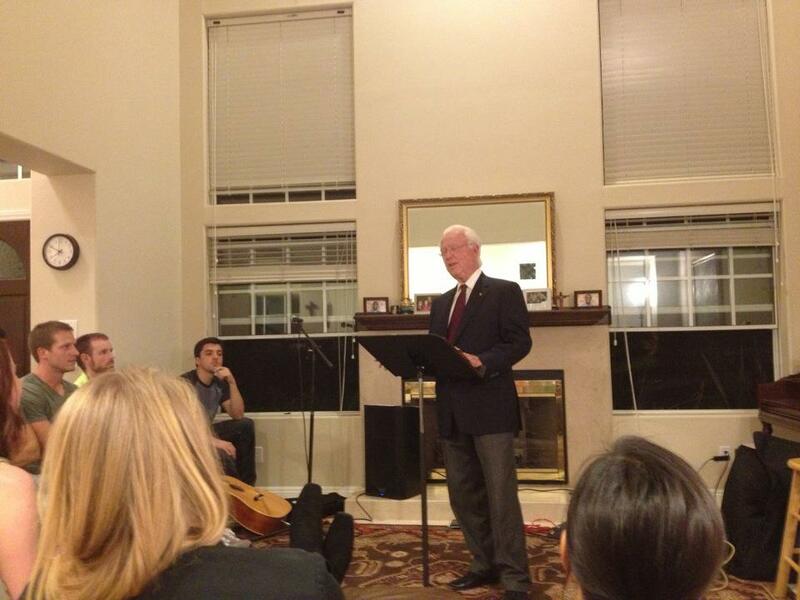 Last night, Dean Phillips spoke to a large number of law students at a weekly Bible study in Professor Gash’s home (aka, “Wednesday Night at the Gash’s”). This was a wonderful opportunity for the students to hear his remarkable story, along with inspiring words of wisdom.